Alex&Co. serves as a cafe, restaurant and bar. Has Parramatta’s food scene been given the fine-dining boost it deserves? Kate Symons gives Alex&Co. a taste. The school discos of my childhood provided chaotic delight: a scout hall full of ra-ra skirts shaking to the tune of Agadoo while budget lighting and smoke machines worked overtime. I loved those smoke machines. While girlfriends were dipping a toe into the labyrinthine world of flirting, I’d be busting a move towards the wandering fog. I was reminded of my smoke machine predilection recently when Alex&Co. dished up the adult version. When my entrée – young kingfish tartare, sea grapes, watercress, tomato granita and green olive – arrived, it was closely followed by a chef armed with tomato consommé and liquid nitrogen. As he prepared the granita tableside, a familiar mist swirled around us. Gimmicks aren’t often my bag, but this one impressed. And I really wanted to be impressed. Parramatta has long been touted as Sydney’s next ‘it’ postcode, but the evolution has been slow. Alex&Co. is the precinct’s new high-end offering and the ambitious project shapes up as a missing piece of the cultural puzzle. 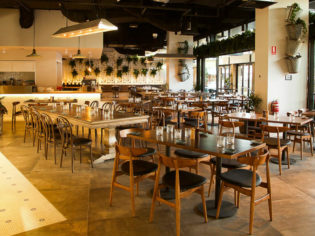 The $2.5 million venue has cast a wide net, trading as a cafe, bar and restaurant. The vast space – it seats 350 – stretches across 600 square metres underneath the new Meriton Altitude towers: cocktail bar at one end, restaurant at the other. Executive chef Kyle Quy (Nola Smokehouse) has peppered his modern Australian menu with international elements; a nod to the restaurant’s multicultural home. This is most obvious with the ‘Parra spice’, a signature mix including sumac, cumin and turmeric. I get my fix with the ‘Parra spice’ roasted chicken, served with asparagus, carrot, leeks and eschallots. It is vibrant and tangy, and I am jealous of our neighbours who ordered the ‘Parra spice’ fries. Among the small plates and entrées, the butternut pumpkin risotto with burrata, pepitas, dukkah and balsamic vinegar is a signature dish and, I’m told, one of the most popular. For casual occasions, a bar and pizza menu is available. There is also a selection of mains designed for sharing, such as the three-hour braised lamb shoulder. When I indicate an intention to share dessert, our waiter makes a size-based recommendation and, as well as ample, the lemon meringue bombe Alaska is a standout. Silky Italian meringue and smooth lemon sorbet combine deliciously with coconut ice-cream (although the menu stated vanilla). While the service could barely be faulted, the same could not be said for my breakfast visit earlier the same week. Teething issues included: slow service despite a comically imbalanced waiter-to-diner ratio; a long wait for food; an undisclosed key ingredient substitution; and – perhaps most tragically – hard-boiled coddled eggs. An unprompted discount helped ease the disappointment. Alex&Co. lacks nearby like-for-like competition, which will likely encourage locals to persist in the event of a poor first impression. And if second impressions are anything to go by, this venue will be a hit. Verdict: A solid start. Assuming the teething issues are ironed out, Alex&Co. could be the five-star venue Parramatta craves. We rated: The cocktail menu by award-winning Max Greco (Eau De Vie, Vasco). I look forward to returning for a tipple or three. We’d change: The lukewarm daytime approach. I’m all for a lazy brunch, but it’s not the service that should be sluggish.